Go from zero to hero with my comprehensive, real-world Swift tutorial projects. You can always be guaranteed you're learning the latest, greatest Apple technologies because all my tutorials are written for iOS 12. Don't waste time with old tutorials – all my books are written for the latest version of Swift, and come with free lifetime Swift updates. You learn Swift while you make real-world iOS projects, which means you get to apply your new skills immediately and see them work in context. Hacking with Swift is one of the most popular Swift tutorial series online, and now you can learn Swift here too – completely free! 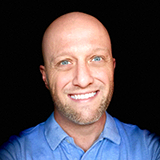 My name is Paul Hudson, and I wrote Hacking with Swift to help you learn to make apps for iOS, macOS, watchOS, and more. On this site you can find my free Swift tutorials, lots of other awesome Swift books I wrote, a huge collection of Swift example code, plus Swift news, tips, and tutorials to help take your learning further. 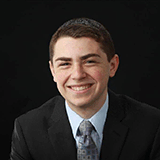 I've already helped thousands of people to learn Swift coding, and I'd love to help you too. Feel free to get in touch if you have questions – you can email me at paul@hackingwithswift.com or tweet me @twostraws. Get an immediate $5 off the Hacking with Swift e-book sent to your inbox, plus more discounts in the future! Admit it: you're thinking, "this can't be free; what's the catch?" I've written 40 complete iOS tutorials that teach you Swift 4.2 from scratch while you build real projects. They are all available online to read for free. I cover my hosting costs with adverts. 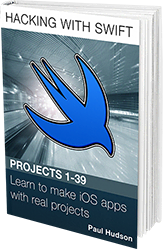 My approach teaches you Swift programming incredibly quickly, and you end up with a huge library of finished projects that are yours to develop further or ship to the App Store. I sell other books that continue teaching you Swift coding. I'm confident that after you've read Hacking with Swift you'll have learned so much you want to support my work by buying a book. 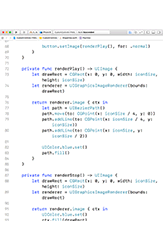 Programming is an art. Don't spend all your time sharpening your pencil when you should be drawing. I've written a range of books that help you build your skills from beginner through to advanced. I've written a lot of books, so it can sometimes be hard to know where to start. To make things easier, I've highlighted a few common kinds of reader and recommended books for each of them. If you have further questions, don't hesitate to email me at paul@hackingwithswift.com or tweet me @twostraws. New to Swift? Start with Hacking with Swift or Swift in Sixty Seconds. These will teach you the fundamentals of Swift and iOS development so you can get started as fast as possible. Want to grow your Swift skills? Start with Pro Swift and Swift Design Patterns, then follow up with either Advanced iOS Volume One or Advanced iOS Volume Two. You would also benefit from Hacking with Swift Live: Series 1, which covers a range of advanced techniques. Want to get a job as an app developer? Start with Pro Swift and Swift Design Patterns, then follow up with Swift Coding Challenges. You may also need to read Objective-C for Swift Developers depending on the job. Want to work on other platforms? I have books for macOS, watchOS, and tvOS, plus two books on server-side Swift: Kitura and Vapor. Want to learn for free? 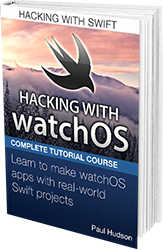 All of Hacking with Swift is available online for free, as is all of Swift in Sixty Seconds. You should also check out my Swift Knowledge Base, Swift coding tests, and Swift interview questions – they are all available free! HACKING WITH SWIFT Start learning Swift 4.2 with the series that started it all: 1600 pages of tutorials teaching you Swift from scratch, with exclusive extra content available in the download edition. 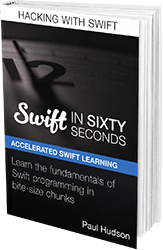 SWIFT IN SIXTY SECONDS Want to get started with Swift, but find yourself short on time? This course teaches you the fundamentals of Swift programming in 60-second chunks. PRO SWIFT Watch advanced videos that will level up your Swift knowledge: functional programming, protocol-oriented programming, value types, closures, operator overloading, and more. SWIFT DESIGN PATTERNS Learn smart, idiomatic techniques to design great Swift apps, from using MVC effectively through to MVVM, delegation, protocols, and more. TESTING SWIFT If you're serious about writing great code, you need to be serious about writing great tests. 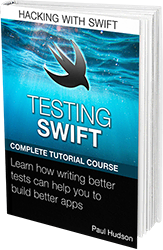 Testing Swift is designed to guide you through unit tests, UI tests, TDD, and much more! SWIFT CODING CHALLENGES Work through real Swift coding problems that help strengthen your skills – perfect for finding and filling holes in your Swift knowlege, and preparing for iOS interviews. 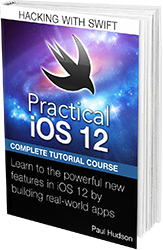 PRACTICAL iOS 12 Build powerful real-world projects using Apple's latest iOS – there is no faster way to get up to speed. 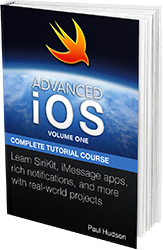 ADVANCED iOS: VOLUME 1 Build awesome, real-world projects using APIs introduced in iOS 10, and learn about speech transcription, SiriKit, iMessage apps, the new rich media notifications, and more. 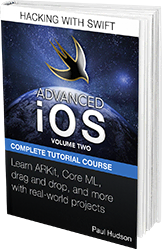 ADVANCED iOS: VOLUME TWO Build powerful real-world projects using powerful technologies like Core ML, ARKit, PDFKit, drag and drop, Core NFC, and more. DIVE INTO SPRITEKIT Learn to build high-performance games for iPad with a unique twist: you get to choose what should happen in each game. It's your game – you decide! 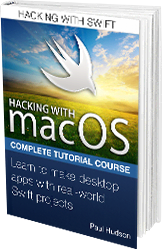 HACKING WITH macOS Power up your desktop by learning to build macOS apps – I'll teach you everything you need to know, while helping you build real-world projects that take full advantage of macOS. HACKING WITH watchOS Build powerful, useful apps for Apple's tiniest devices – this book gives you everything you need to make great apps that quite literally never leave your user's side. HACKING WITH tvOS Build for the biggest screen of all – take full advantage of the Siri remote and build incredible apps and games using UIKit, SpriteKit, and more! 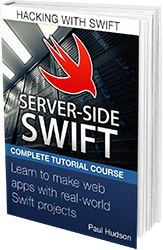 SERVER-SIDE SWIFT Transfer your Swift skills to the server and learn to build awesome web apps, APIs, and websites all using Swift. OBJECTIVE-C FOR SWIFT DEVELOPERS Round out your iOS coding knowledge with Apple's original language – this whole book has been designed to teach you Objective-C as quickly as possible by building on your Swift skills. 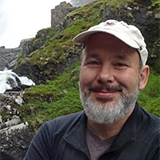 BEYOND CODE Learn the meta skills you need to be a better coder: regular expressions, Unix command line tools, Git source control, Scrum project management, and more. VIDEOS Buy recordings of online video workshops that teach specific advanced topics, all in 1080p high definition – it's an incredibly convenient way to learn. 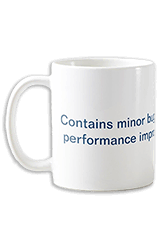 MERCHANDISE Buy some Swift-themed gifts for yourself or your favorite programmer friend and you'll learn Swift faster. Probably. Q: Will I get updates when new Swift versions are released? A: Yes! Your purchase is covered by the most awesome book updates policy in existence: books get updates for new Swift versions completely free, for the life of the book. 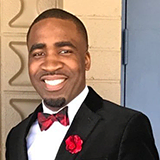 Click here to read my book update policy in full. Q: What version of Swift do you use in your courses? A: I use Xcode 10 and Swift 4.2 in all books, except for Objective-C for Swift Developers – that uses Objective-C, obviously. Q: I'm a beginner – what books are suitable for me? Q: Why should I buy your books rather than someone else's? All books come with a Lifetime Swift Update Policy, so you can buy with confidence knowing you'll get updates for free in the future. My Swift Frequent Flyer Club delivers rewards for readers who buy multiple books – there's a growing library of bonus content to enjoy! All books you buy come with a completion certificate so you can track your career development progress. I consider it a privilege that so many readers choose my books when there are so many others out there, and I want to make sure I always deliver above your expectations. Q: How can I read Hacking with Swift offline / without ads? A: You can buy the premium Hacking with Swift book set for just $40. You get the same projects you can find online here, as well as 600 tips and tricks from my Swift Knowledge Base, and more. 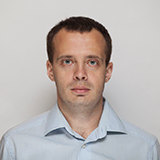 Q: I can already program Swift – will you teach me new stuff? A: I wrote a separate book and video course called Pro Swift which teaches advanced Swift coding. It covers functional programming, MVVM, reference and value types, closures, operator overloading, and much more, and includes 96 videos walking you through the techniques. While Hacking with Swift definitely touches on more advanced topics as you proceed, Pro Swift is all advanced, all the time. Note: You don't need to have read Hacking with Swift in order to get the most out of Pro Swift, but it certainly helps! Q: Is knowing Swift enough? Do I also need to know Objective-C? A: It's true that most iOS jobs want some Objective-C knowledge, because there are over a million apps written in the language. 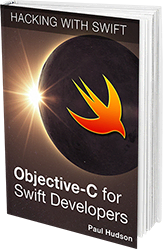 To help you learn, I wrote a book called Objective-C for Swift Developers, which is designed to help you transfer your skills from Swift to Objective-C as quickly as possible. Q: Do any of your books overlap? A: No – they are all designed to be unique, standalone books. Q: Can I buy your books on iBooks? A: Yes, you can buy my books on the iBooks Store. For more information and links to the full range, click here. Please note: If you buy the original Hacking with Swift book through iBooks you don't get the bonus content, because it's not compatible with the iBooks Store. If you want the bonus content please click here to buy through Gumroad. A: I try to keep my books priced as low as possible; if you look around, you'll find other courses sell for twice as much, despite offering far less content. However, if you sign up to my monthly Swift newsletter you'll get discounts every month. Q: Can I buy your books in a bundle? My first six books are available in the Swift Power Pack at a big discount – you get all six for just $150, which is a 32% saving on their regular price. The next six books are available in the Swift Platform Pack, also for $150, which is a 37% saving on their regular price. Even better, if you buy any of the books from a bundle individually, you can upgrade to the full bundle at a later date just by paying the difference – email me and I can generate the discount for you. Q: What is the Swift Frequent Flyer Club your books talk about? A: Everyone who buys any of my books gets access to bonus content as part of my Swift Frequent Flyer Club. Click here to claim yours! 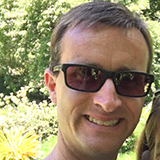 Q: Will you come and speak at my conference / user group / podcast? A: I'm happy to deliver talks and short sessions at conferences and user groups, although you'll need to cover my travel costs from the UK. 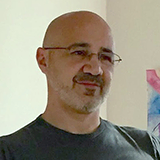 I also run hands-on Swift training courses lasting from one day to five days – please email paul@hackingwithswift.com and let me know what you need. 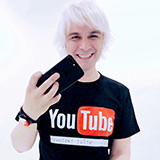 I'm always happy to speak on podcasts about Swift, iOS, macOS, or other similar topics – get in touch! Q: What are "Pulp Fiction brackets"? A: Pulp Fiction brackets are < and >, also known as "angle brackets." Q: Why do you insist on teaching using projects? This series has been built on the back of my personal motto: "Programming is an art. Don't spend all your time sharpening your pencil when you should be drawing." We'll be doing some "sharpening" but a heck of a lot more "drawing" – if that doesn't suit your way of learning, Hacking with Swift isn't for you. Q: What should I do if I spot a mistake? A: If it's a typo or a coding error, please do email me at paul@hackingwithswift.com or find me on Twitter @twostraws. However, please keep in mind that these projects were designed to be simple and digestible learning examples, not fool-proof, App Store-ready perfections. That means sometimes there are bugs that exist because some longer or more difficult code has been removed or simplified – you're welcome to fix these in your own projects, but I think it would just confuse learners to fix them here. Q: Does Hacking with Swift have any Firefly references? I want Firefly references. Where are the Firefly references? A: They are, quite literally, all in the official Swift reference from Apple. Shiny!